EX-SERVICEMEN WELFARE: HOW MANY OF OUR ARMED FORCES (SERVING/RETIRED) PERSONNEL CAN FOLLOW THIS? HOW MANY OF OUR ARMED FORCES (SERVING/RETIRED) PERSONNEL CAN FOLLOW THIS? Sir, hats off to you, many would be ready to crawl on their knees to be there. Your subconscious has guided, you are true with olq, thanks on behalf of all afvs. 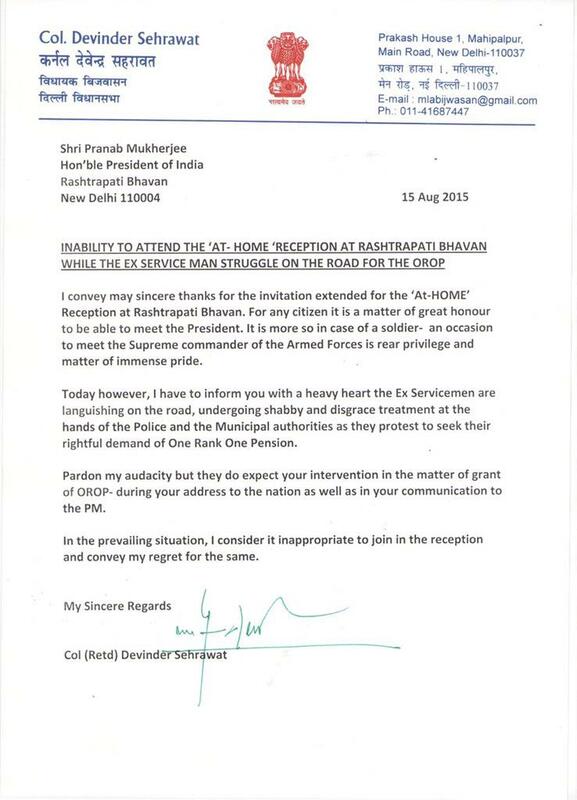 A good fauji gesture, sir ! I REALLY APPRICIATE YOU COL(RETD) DEVINDER SEHRAWAT SIR. Respected Col Sahab ,Really you are the HERO Of VETERNS and YOU should be honoured.You are an example for the present serving CHIEFS and Gen VKS and COL RATHORE Sahibs. Natural reaction of true nationalist,senior citizen and patriot . Public will naturally appreciate your boldness and courage. many would look at all your actions ,with benchmark at this stand of yours.Well done !